As a request, I’ve been asked to write about my experiences with being big at school and how I overcame it to be the confident-ish girl that I am today. I say confident-ish, because truthfully, I still have my low days. Days when I honestly wish I could slip out of my skin and emerge to be this size 8 gym bunny. And I know that through dieting, a change in lifestyle and a consistent weight-loss, this is an option that if I wish to do, I could achieve in a few years time. But the majority of the time I quite love being the happy size 14 that I am, and that I do have curves that can sometimes look almost comical. But at school I was never this confident. I wasn’t curvy at school as such, but just… big. Big, round and dare I say it, fat. I had a moon face with spots, my eyes seemed to disappear into my fat, my stomach was massive and my legs were like elephants. And this isn’t just me being cruel and self-reflective. There are photos of me back then that I look back at now and think ‘god I was big’. And it didn’t help that my school was pretty late in embracing healthy eating, or that I had no clue about doing such a thing. I also had the other bit of growing up in a pub, so cheap and filling gastro food was my meals most days. But, I don’t like putting blame of other people. I could have not got a whole box of cookies everyday after school and eaten them on the short walk home. I didn’t have to get McDonalds every weekend, and I didn’t have to devour countless chocolate bars and crisps and just other fattening things. I am entirely guilty for my weight back then. But I am also responsible for my weightloss too. At school, I had my share of bullying. Some about my size, when I would be called a ‘whale’, or ‘disgusting’ or just ‘fat’. But some about silly little things like the shape of my mouth the fact I wore glasses, (four eyes, nerd, geek etc), and the fact that I had, and still do, crooked teeth. And from this, in my own unhappiness, and want for power and acceptance, I started to become a bully. And, now I’m so ashamed to say it, I began to bully people in my friendship group, just because I could and I felt that they would forgive me. So it was a vicious cycle of the bullied-becoming-the-bully. So, how did I change? How did I change my eating, weight and life to become healthier and happier? Well, it started after a family funeral. One that came as a shock to all of us. And whilst at this funeral, when I was surrounded by my much smaller cousins, something clicked. And I thought ‘I can’t go on this way’. Now, I was never at risk with my health. But I was going towards that if I kept my eating patterns the same way as I did. So, I began exercising – a story which I will go into more detail in a later post – and began eating salad, good proteins and less processed fat. And I was so surprised. I began sleeping better, felt happier and had more energy. And my mental health rapidly improved, so I was overall a better and happier person. So that’s what I say to you, reader. If you want to lose weight, then do it. But it has to be to make you happy. I am well aware that there are some people who are perfectly happy being bigger, and being plussize. And I completely respect them, and am a keen supporter in body confidence of any size. But making sure you’re healthy, happy and above all, content with yourself is the only thing that is important in your life. And if you want to ask me any questions, then please do. I’m not a skinny of a fat shamer. I’m a body confidence lover. And that’s no matter what shape, size, height, whatever you are. 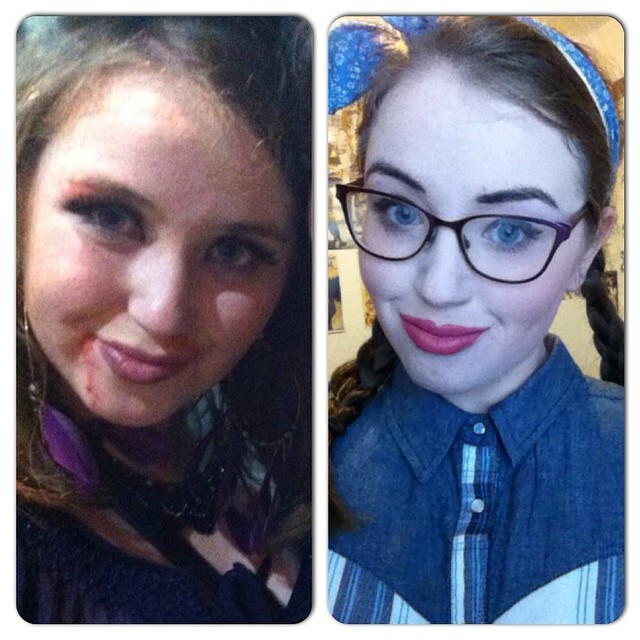 My before and after – Before was Halloween 2013 After is March 2015.